2 Double bedrooms. 1 Twin bedroom. Living room: with beamed ceiling, sofa, armchairs, dining area with table. Kitchen: tiled work surfaces, fitted pine cupboards, gas and electric hob, combination microwave and conventional oven, automatic washing machine, dishwasher, refrigerator and dining table. Utility room: with washing machine and basin. Shower Room: with shower, W.C. and basin with vanitory unit. Sitting room with TV, door to …. Terrace: south facing with pergola and fine views towards the Luberon. Outside table, umbrellas and chairs. Master Suite: Bedroom with direct access to terrace. Ensuite bathroom. Separate study area. Master bedroom with double bed and ensuite shower room. Outside Amenities: There is a south facing terrace, with lovely views, which is accessed from the 1st floor sitting room.. It has a pergola covered with vines and wisteria. There is a large outside dining table, umberellas and chairs. There is also a small Provencal rock garden and a plunge pool with a wave machine. 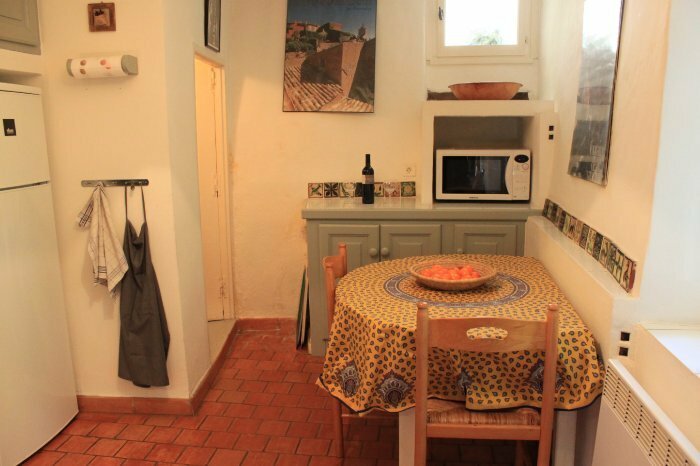 Surrounding Area: Goult is a charming conservation village in the heart of the Lubéron. It is situated within easy reach of many interesting and beautiful places, including Avignon, Aix-en-Provence, Gordes, Isle-sur-Sorgue and Fontaine de Vaucluse. It is one hour by car from Marseilles International Airport. There are many excellent vineyards within easy reach where one can go wine-tasting. In the summer there is an internationally renowned music festival in the area, and concerts are held in the beautiful 12th century village church in the main square of Goult. The village has very good shops, including a baker, butcher and well-stocked general store. Supermarkets are within easy reach at Cavaillon, Apt, and Isle-sur-Sorgue. Most villages in the area have local markets once or twice a week. There are four excellent restaurants in Goult and also a bar and café in the main square. Electric heating throughout and an open wood fire. Mains water. Mains drainage. Electricity. Telephone. WiFi Broadband Internet Access. Television. Satellite TV. Hob. Microwave. Combined Fridge/Freezer. Dishwasher. Washing Machine. Microwave combination oven with grill. Children welcome. No smokers. No pets allowed. BBQ. Pool. Pricing Info: One month deposit required. Electricity is not included for long lets. Logs are not included. Linen can be hired but is not included in the rent.